As the Philippine economy powers up in 2015 add to that the upcoming ASEAN integration, and annual growth of 20 percent in the franchise industry, the country has the potential to become the franchising hub in global manner. Did you know that there are over 1,300 local and international franchises, thus making franchising a preferred route for many Filipinos to start their own business. 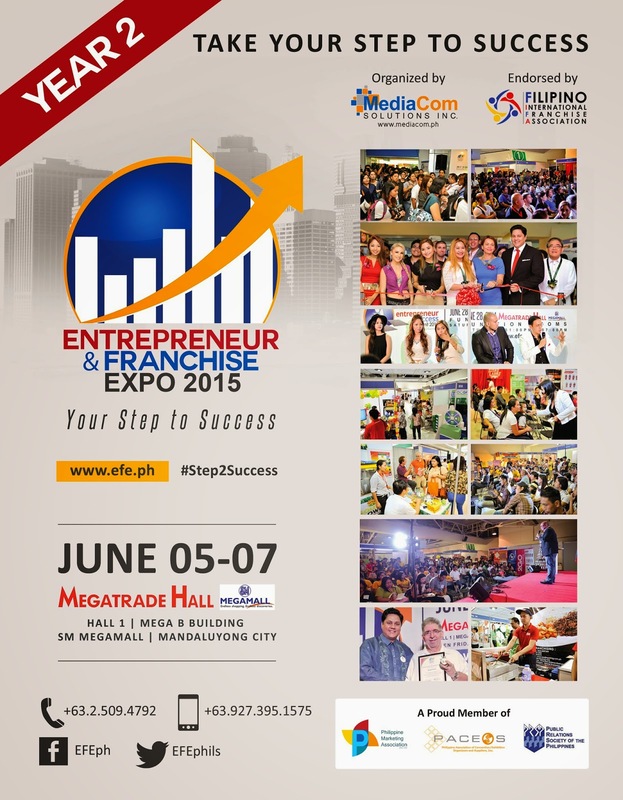 With these, MEDIACOM SOLUTIONS INC. will once again bring us ENTREPRENEUR AND FRANCHISE EXPO now on its second year. They carry the tagline, Your Step 2 Success!, is set to be held on June 05-07, 2015 at the Megatrade Hall 1, 5th Floor, Mega B Building, SM Megamall, Mandaluyong City, Philippines to strengthen the growth of franchise businesses and Small and Medium Enterprises (SMEs). Last year the show featured 88 businesses and attracted over 11,000 visitors covering over 1,348 square meters of exhibit space. In 2015 the show will feature 108 top franchise businesses and Small and Medium Enterprises (SMEs) from various business sectors and expects over 15,000 attendees. Visitors will be able to explore franchise opportunities from various business sectors, such as food, retail, education, travel, health and beauty. The show is also featuring industry suppliers and SMEs from the agriculture, manufacturing, technology, automobile, logistic and financing sector and will hold several activities to encourage business professionals, company owners and decision makers to meet face to face. “In 2015 we are expecting to see many new brand concepts at the expo, especially in the service industry, like beauty, healthcare, education and wellness. Our vision is to strengthen local businesses and provide a platform for them to showcase their innovative products and services. We also provide assistance for business owners and executives to network amongst other professionals and stakeholders in order to open opportunities for aspiring entrepreneurs to start their own business and for local businesses to grow regionally” says MEDIACOM SOLUTIONS INC. President and Entrepreneur and Franchise Expo Founder and Managing Director, David Abrenilla. If you are interested to visit the show, register for Free online at www.efe.ph. Interested to exhibit? Contact ELVIS ELORDE at +63.2.509.4792, +63.927.395.1575 or send an email at elvis@efe.ph. Join the community on Facebook at https://www.facebook.com/EFEph.